Hello and welcome to the 132nd installment of the SWD. Syrian Democratic Forces continue making limited advances against Islamic State in a number of districts of Raqqa city. SDF reportedly made advances in Al-Barid, Hittin, Al-Qadisiyah, Yarmouk, and Al-Nahda districts. In Al-Batani district, SDF destroyed IS’ SVBIED before it reached their positions. 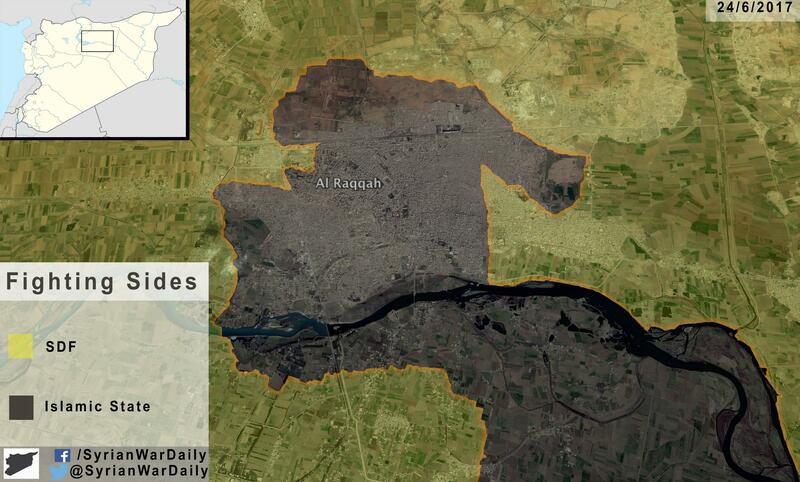 Situation in Raqqa, HD version of this map can be found here. VBIED exploded targeting civilians near a market in Hayat Tahrir al-Sham’s stronghold of Al-Dana. Reports suggest that around 12 civilians were killed and more than 20 injured in the explosion. Hayat Tahrir al-Sham and Ahrar al-Sham clashed in Salqin with reports about casualties from both sides. Clashes didn’t last long, as the reports reported calm in the locality an hour or two after reports about clashes. Syrian Arab Army advanced north of Ithriya Pumping Station and captured Tell Al-Abjar from Islamic State. Syrian Arab Army reportedly captured Arak gas field from Islamic State, northeast of Arak. Faylaq al-Rahman claimed it destroyed SAA‘s T-72 as the latter tried to advance on Ain Tarma front. Rebels launched an attack against SAA on Madinat al-Baath and Samdaniyah al-Gharbiya, heavy clashes are ongoing for hours and rebels are allegedly in control of half of Madinat al-Baath. Israeli warplane also got involved in today’s clashes by targeting two SAA‘s military vehicles after several projectiles fell in Israeli-held Golan Heights. The casualties from Israeli airstrikes are estimated at two SAA‘s soldiers. 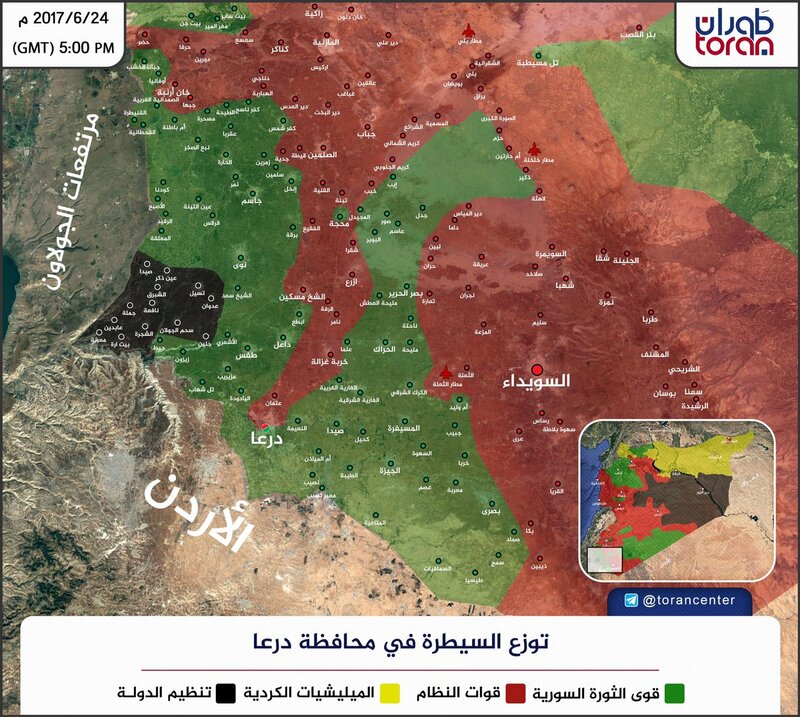 Rebels and Syrian Arab Army clashed in a number of districts of Daraa and around the town. East of Daraa, in Al-Naimah, rebels targeted a group of SAA‘s fighters with a TOW missile and allegedly killed the whole group. Rebel group, Shabab al-Sunna, reported it targeted SAA & allies convoy on the road between Khirbet and Daraa with heavy weapons causing several casualties. 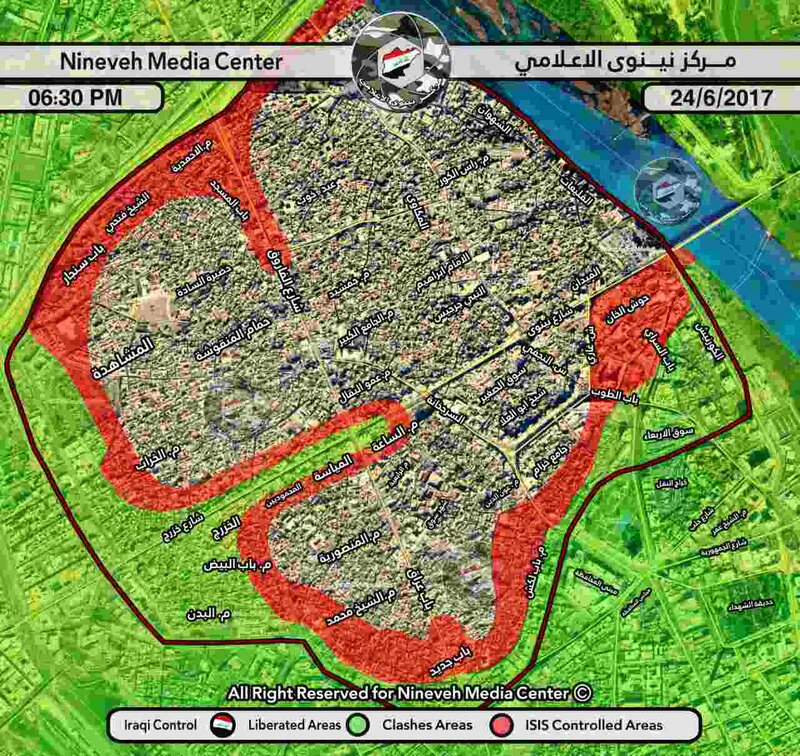 Situation remains unchanged in west Mosul territory-wise, Iraqi forces have been evacuating civilians from the clash areas for two days now. Amaq Agency claimed destruction of a Humvee and a bulldozer in Bab al-Toub and Al-Khazraj neighborhoods, and an SVBIED attack against Iraqi forces in Al-Mashahedah area. In the eastern Mosul, two Islamic State’s inghimasi (suicide fighters) attacked a market in Al-Muthanna district. One attacker was killed by security forces, while the second one forcefully detonated himself after a policeman “hugged” him. Five civilians were killed and 18 injured by IS’ fighters, as well as, three policeman killed and one injured. Islamic State’s improvised explosive device allegedly killed three Peshmerga and wounded another two in the village of Al-Hajj Mohammed, Daquq district. Al-Hashd al-Shaabi fighter was assassinated and two more wounded by the Islamic State in the village of Al-Mirir, north of Al-Shirqat. Islamic State claimed responsibility in their own way for the yesterday’s attack in Baghdad al-Jadida, southeast Baghdad. According to Amaq, VBIED exploded in Al-Nairiya area killing 13 and injuring 10 Shia Muslims. On the 23rd of June 2017 CJTF-OIR has conducted 31 strikes in Syria. CJTF-OIR‘s main focus in Syria at the moment is Raqqa region where they did 21 strikes supporting SDF‘s operations against IS destroying 10 fighting positions, six vehicles, a VBIED, an IS staging area, a tactical vehicle, a mortar tube, and a mortar system; damaging an IS supply route; and suppressing an IS tactical unit. Other areas where 10 airstrikes occurred are Abu Kamal (Al-Bukamal), Deir al-Zour, Al-Shaddadi and Al-Hasakah, destroying 10 ISIS oil storage tanks, five front-end loaders, two vehicles, two VBIED facilities, a pump jack, four artillery systems and two tanks. Full report on CJTF-OIR strikes conducted in both Syria & Iraq can be found here.